Which fantasy/science fiction character am I? Luke Skywalker, Boldly striving to overcome the darkness both in this world and within yourself, you are righteously devoted to forging your own destiny. It’s your choice, but I warn you not to underestimate my powers. Luke is a character in the Star Wars universe. 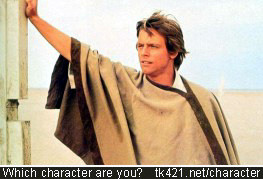 For more information, see his character entry at the Star Wars Databank. If you enjoyed taking this survey and wish to help advertise it and your results, you can use the code below on your site. You are welcome to copy the image to your own Web space.